A large patio umbrella significantly improves your outdoor experience with shade and cooling benefits, as well as, providing a matching or coordinating color to your furniture decor. These replacement umbrellas do not come with a base (stand). 9 Foot Replacement Patio Umbrella Canopy This 9 Foot Umbrella has an Auto-Tilt Feature. Made with the matching fabric you choose. 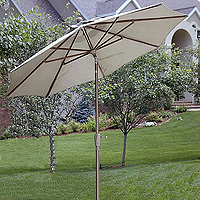 Matching Patio 9 Foot Tilt Umbrella This 9 Foot Umbrella has an Auto-Tilt Feature.